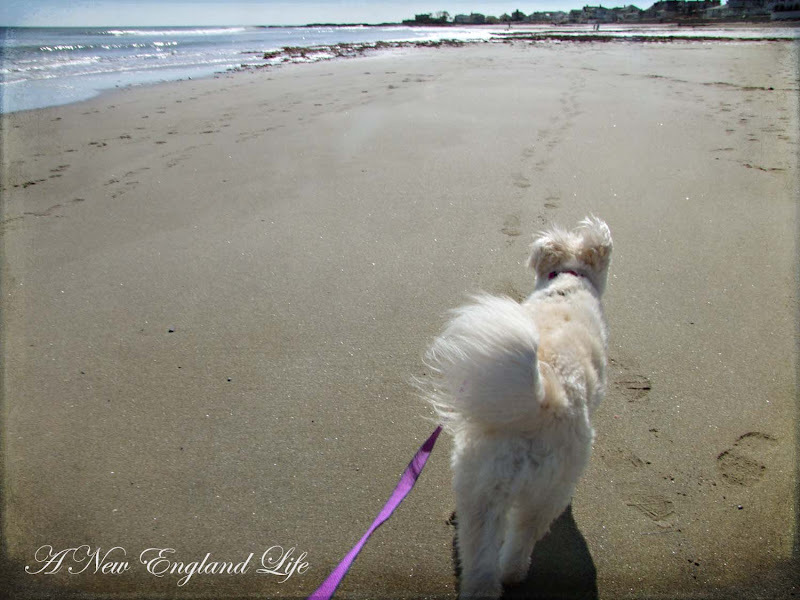 It was another gorgeous day outside yesterday with temps in the mid 50's so Lily and I decided to make the most of it and head to the beach during low tide. The beach has to be Lily's favorite place in the world. Usually I can let her off leash to run and play with all the other dogs. Unfortunately it didn't work out this time so I had to put the leash back on, which she was fine with. Or at least I'd like to think so anyway. Trying to take pictures while galloping along isn't easy! Back when I was a kid this was a common sight, flocks of birds running back and forth along the waters edge. Not anymore. 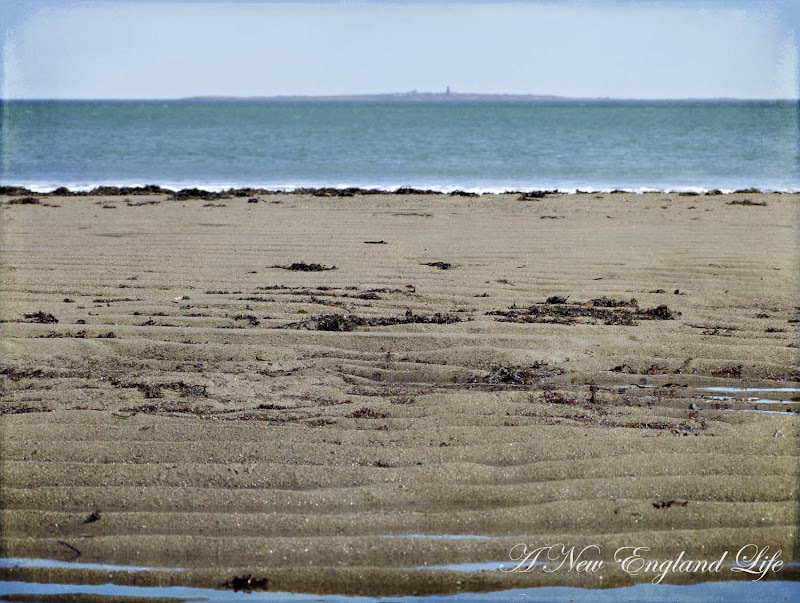 Now people have destroyed their habitat and nests, littered the beaches, and pushed them out. My bird book is pretty lousy so if someone could help ID them I'd be thrilled. So much fun to see them all running in unison. * Leecia and Steve both tell me the birds are Sanderlings! Thanks to both of you! 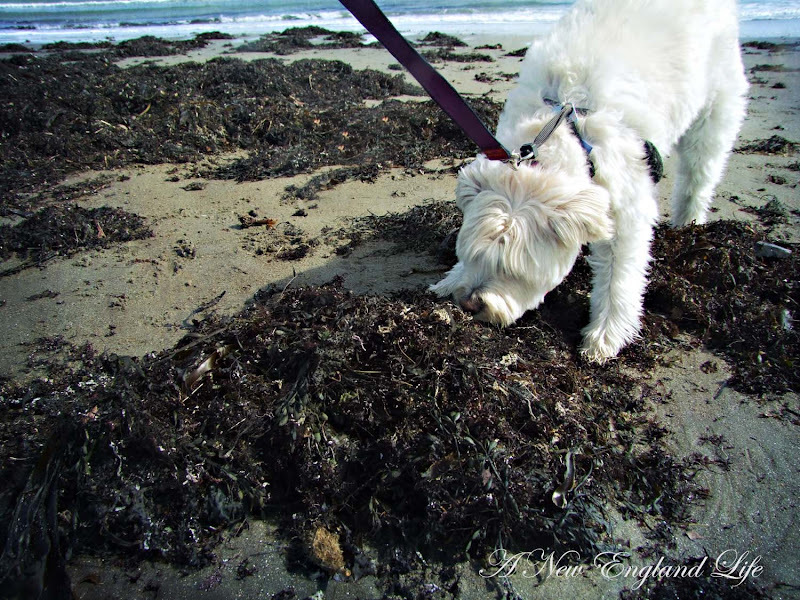 Sneaking up on seaweed, and there was plenty of it to be found due to our resent wind storm and exceptionally high tides. Every big clam shell that was sticking up out of the sand was thrilling yet terrifying at the same time. First Lily would sneak up on one, then if she was brave enough she would pick the shell up and carry it around in her mouth for a while. We brought a bunch of her favorites home with us. Okay sweet girl, I'd say it's time to go. You look pooped out and ready for a big drink of water back at the car. By the time we got home both of us were ready for a quick power nap! It's so cute to see Lily having so much fun on the beach! And I love the picture of the birds running - adorable! Oh, what fun! My dog would simply run himself ragged, sit down and die of bliss if he had a beach to run and sniff upon. The backyard, with its deer and possum smells, is enough to make him crazy. Awww, love that you take Lily to the beach. She even looks happy.. Love it when our pups smile at me. I love your beach pictures Sharon! It was fun this morning taking a walk with you and Lily. A pup that collects shells! How cool is that? i absolutely love that last shot of Lily. What a pretty girl! Lily is such a pretty dog. Sounds and looks like you both had an enjoyable time at the beach. Sorry - I am of no help with the name of the birds. 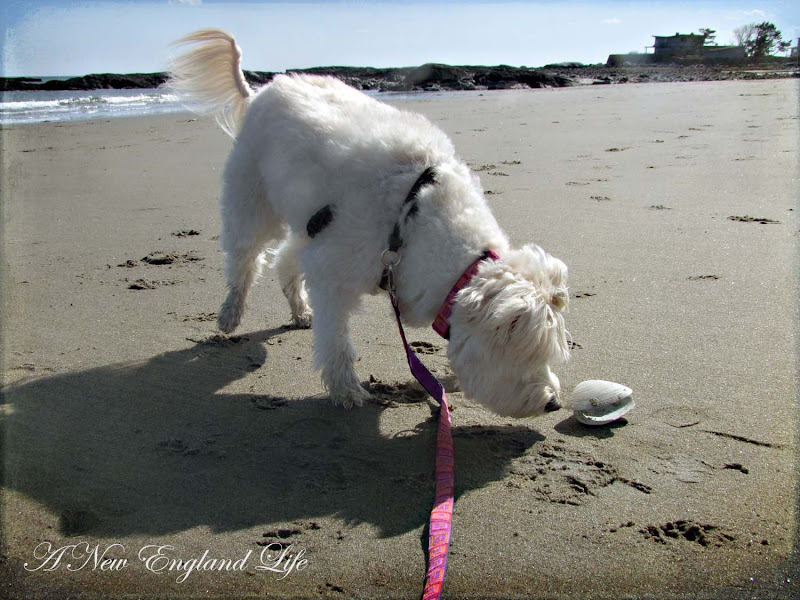 Love the shot of your pup with the clam shell! Such fun! and I think you're right about the semi palmateds. Pretty sure they are Sanderlings & that they greatly appreciated LIly being on a leash. What dog does not enjoy chasing birds? But shorebird need to not waste energy running from "predators" but build up fat for migration and/or breeding. I should mention I love dogs & birds very much! I enjoy your blog so, so much. It is one of my favorites. Esp. your snow pics this winter, since I'm down in FL where seasons are only hinted at. I enjoyed going along with you on your jog and even then your pictures are gorgeous. Lily seemed to enjoy the beach even being on the leash. I wish I could help with the name of the cute beauties...my son could if he were here! Lily is so cute! I love the beach pictures. Isn't a beach to be found here in AZ! See - there's pluses wherever you are! Lily is so cute. Looks like you had a fun afternoon. 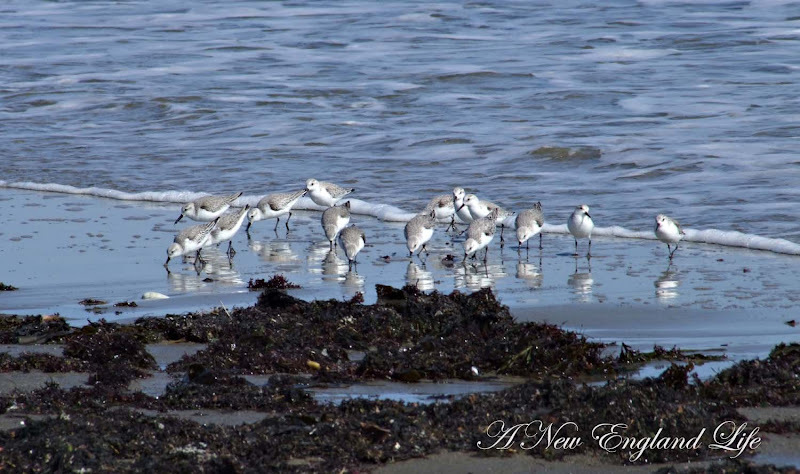 I love the photos of the sandpipers. I love looking at your blog. The pictures are lovely. 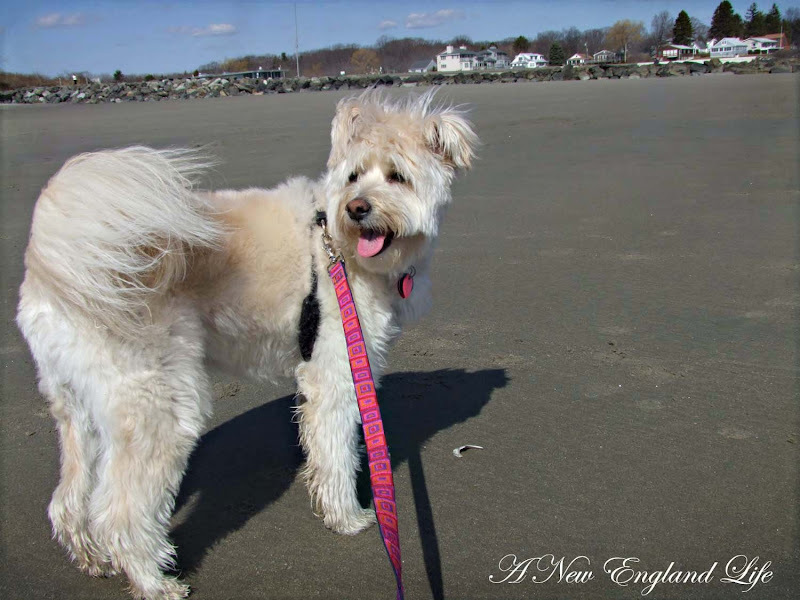 We are looking to move to the NH Saecoast area--Exeter or Hampton Falls-- and your blog is my inspiration! Loved ALL of these shots! 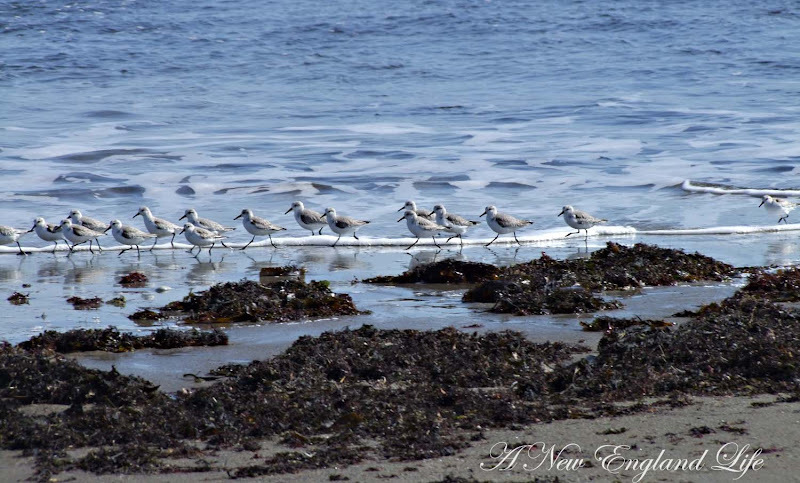 Especially the first birds on the shore one...When are you going to enter my March photo contest??? Love the Sanderlings - and they so often stay in the north during winter - true sandpipers - not mudpipers like most sandpipers. Lily looks like she's having a blast. Such nice photos. Also, I've never seen the Isle of Shoals, but now I have thanks to your blog! I've always wondered about them ever since reading The Weight of Water several years ago. That last picture of Lily is gorgeous but so are the photos of the birds. Lily is adorable!! LOVE your pics of the beach/shells/birds/ and Lily of course! What fun you had! I really hope it just keeps getting warmer Sharon! Love that Lily! What a cutie Lily is. Those scenes are gorgeous. We've really had some nice days but I think it's about to change back on the weekend. Boo hoo!!!! Lily is the cutest! Looks like the two of you had a great beach day. Can you believe how nice it's been lately? Of course this weekend it's going to rain. Lily is really very cute and adorable. Looks like both of u had a great time out there. What a great day! Lily looks so incredibly happy with her windblown tresses. The shore birds made me laugh, high stepping it along the water's edge. So pretty there. You got me laughing on the galloping bit. Very funny! And your pup is precious. 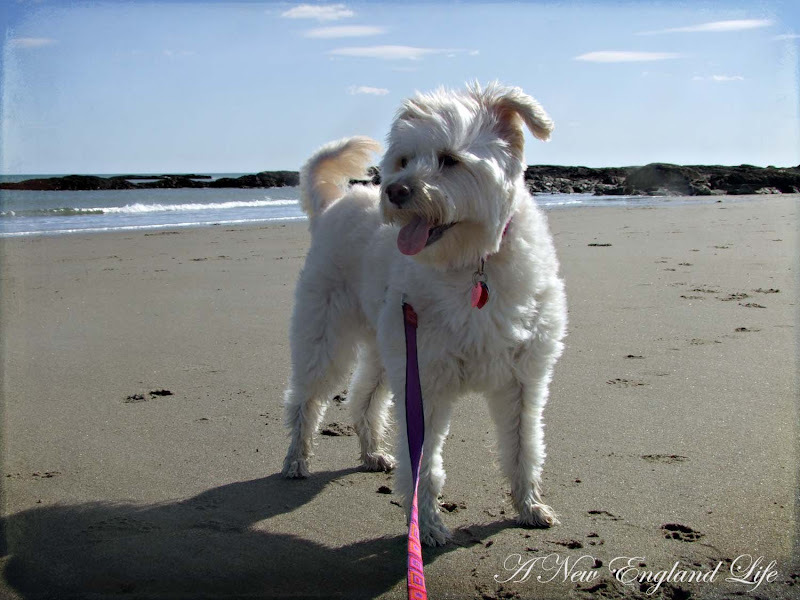 Lily is a lucky dog to have the ocean as her playground. What a happy, pretty girl she is.